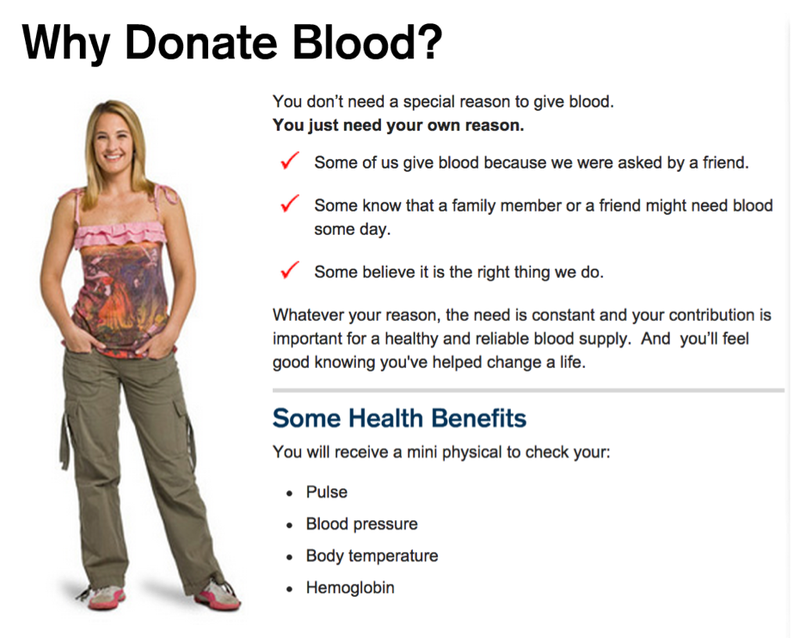 A few weeks ago I opened my corporate inbox and saw an email asking to donate blood. I wasn’t really up to do it but I read the entire email anyway. 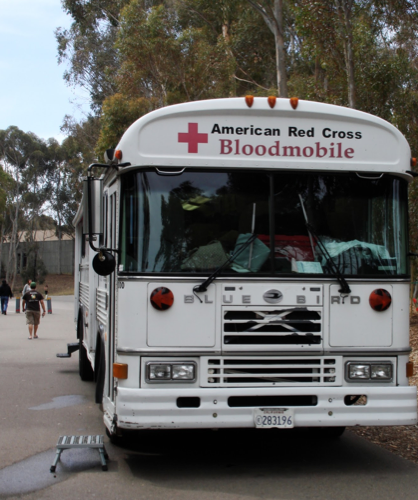 Although the actual event was put on by the American Red Cross, the idea of walking onto a decorated bus dubbed the “Bloodmobile” and giving blood didn’t quite jive with me. After getting over my initial fear, I signed up and received my confirmation email. Like any other email, it slipped my mind and I went through the days as my usual self. Not once did I think about the “Bloodmobile” coming onsite. Then, a few days before the actual event I received an email with the subject line “Blood Drive Reminder (Next Week)”. I didn’t even open the email before I could feel my heart pulsate slightly faster. 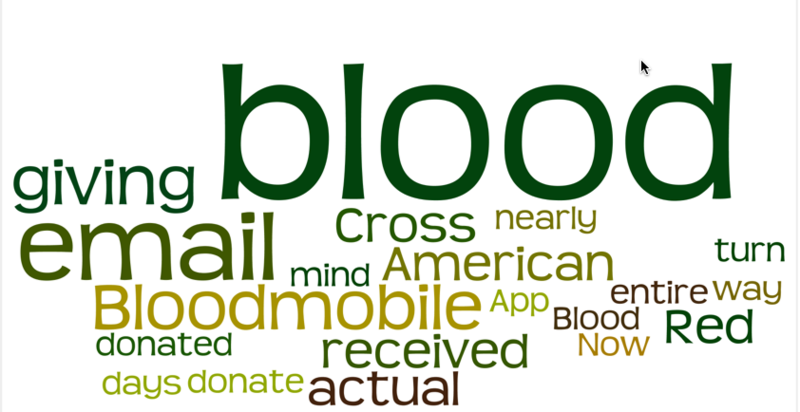 The day had arrived when the Bloodmobile and I would meet face-to-face. I was a bit cautious because I couldn’t picture the actual environment. Once on the Bloodmobile I was greeted by a lovely lady who briefed me on the pre and post process. It didn’t seem too bad beside the fact that giving blood would take nearly 45 MINUTES! After answering a nearly 100 question survey about my entire life, I started to second guess whether or not I really wanted to give blood. What if something is wrong with me? 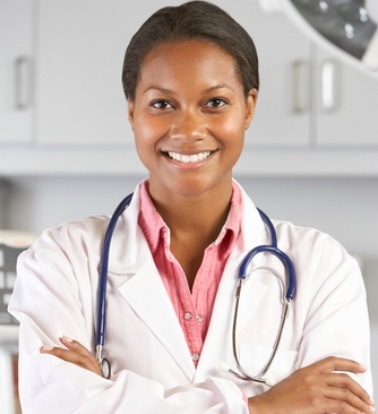 What if the physician can’t find a good vein? What if the needle is infected? Every scenario ran through my mind as I was trying to remain calm among my coworkers (who were also giving blood). When it was my turn, I sat in the left recliner (your choice based on the hand giving blood), formed a fist to activate my veins and closed my eyes. Forty-five minutes later and I had successfully donated blood. I was so relieved that it was all over. I grabbed a snack on the way out and made my way back to work. Now that it’s all set and done, I am so happy I followed my gut and donated blood to the American Red Cross. I will admit that it was scary at first but the onboard physicians made it a pleasant experience. I even received my blood type following the blood drive so now I can prevent the risk of receiving an incompatible blood type surgery. Now it’s your turn to donate blood! Download the American Red Cross Blood App (App Store / Google Play) and continue to follow @myhealthimpact for more personal health stories! I’m not sure if you noticed, but the new iPhone just came out. What?!?! You never heard of the iPhone. It’s only the same phone Apple been selling to millions for the past couple of years. Seriously, the iPhone 6 “dropped” last month, and people are just eating it up. Yes, I’m an android user, so my opinion may be a bit biased. For Apple to be a company based on innovative design, they sure are conservative of the design aspects of the phone. 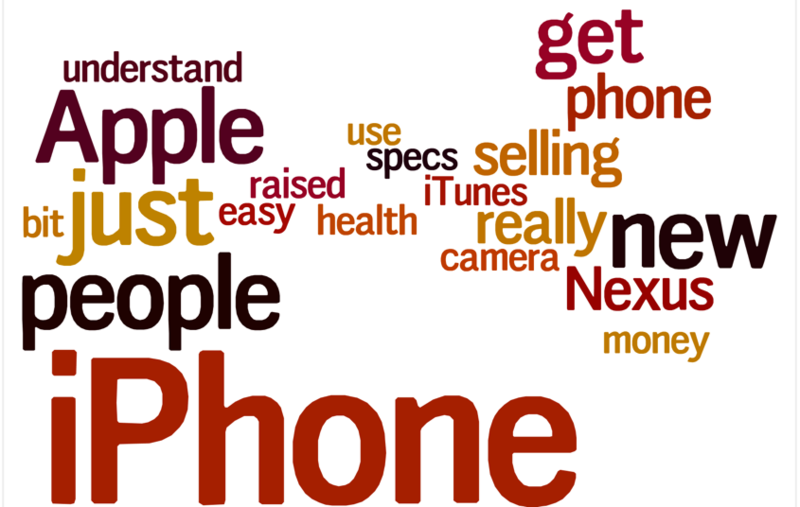 I understand the iPhone is easy to use and popular, but why is it so popular? 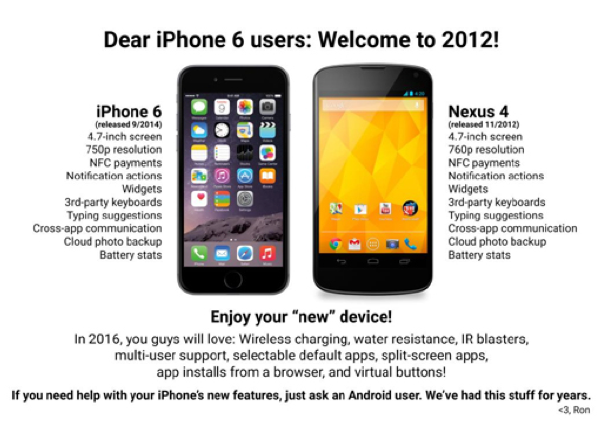 If you compare the specs for the iPhone 6 (2014) and the specs of a Nexus 4 (2012), they’re not so different. Well actually, they’re almost completely identical. To make matters worse is the price between the two. The Nexus 4 is $199 with no contract while the iPhone 6 is $649. With that said, why are people so quick to covet this new (old) device? Would it not be better just to save money and get the older Nexus 4. I understand there is a preference of operating systems, but c’mon and extra $400 in your pocket would be pretty nice. Does Apple have mind control of the people that buy it? Is the iPhone really that easy to use? What is Apple really selling? I know iTunes isn’t that great downloading that U2 album to everyones iTunes and all that. The name. Apple is selling the lifestyle, the popularity, and acceptance to the community of having a iPhone. Also the camera. Not to get technical, but the iPhone camera does set a new standard for the other various smartphones out there. We, as young people, are addicted to having the latest and greatest of almost anything. I’m guilty myself. Millennials and digital setters were raised to have high expectations to what technology brings. We are raised to think ahead and continue to innovate. This addiction to the innovation and creation of new technology is our social driving force. We want to to relate to whatever is new and socially accepted as “in”. 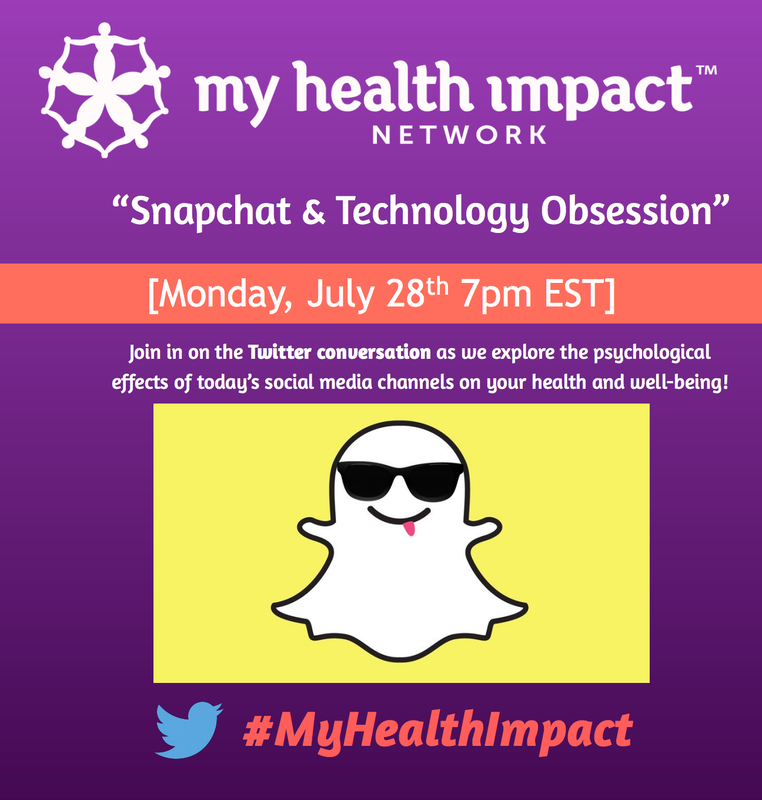 Follow us at @myhealthimpact as we continue to discuss #techtalk that impacts health and health access. Calling all angry BLACK women! It is now our time to speak up and rejoice in our rage. (That was definitely not serious by the way!) I’m sure by now that most of you have heard about the New York Times article by Alessandra Stanley. 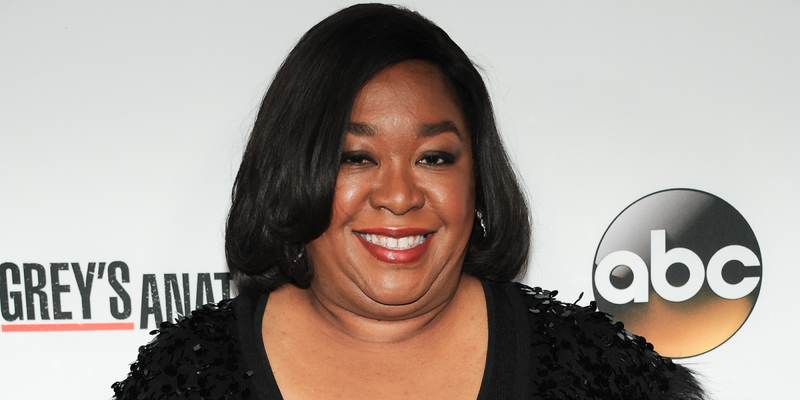 Stanley claims to have used intense language as literary devices to pay homage to “angry black woman”, Shonda Rhimes, a renowned African-American screenwriter, director, and producer. Honestly, I think it’s crazy that the article was even published due to the cultural insensitivity of the editors. This must have been a publicity stunt for the NY Times because the backlash has been incredible. So many actors, actresses, and television personalities have taken to twitter to voice their opinions on the disrespect Rhimes received. As a woman of color attending a PWI, Predominantly White Institution, I have often found myself trying my hardest not to fulfill all the horrible stereotypes that are associated with what I look like. Being one of the 2 African-American females of the 199 in the PhD Program has bothered me so much that I have gone to extra lengths to blend. For example, I started wearing glasses to look smarter and blend with everyone else in my lab who wore glasses. I felt like I had to make myself look smarter because I looked different from everyone else. I wanted to look like I was intelligent because I feared that they thought I was not. Honestly, sometimes I feel like the more that I advance in my education, the more I feel like I have to diminish the things that make me unique from my counterparts. It’s hard enough with the pressures I put on myself; having the pressures of the media reinforcing the stereotypes is definitely overbearing. 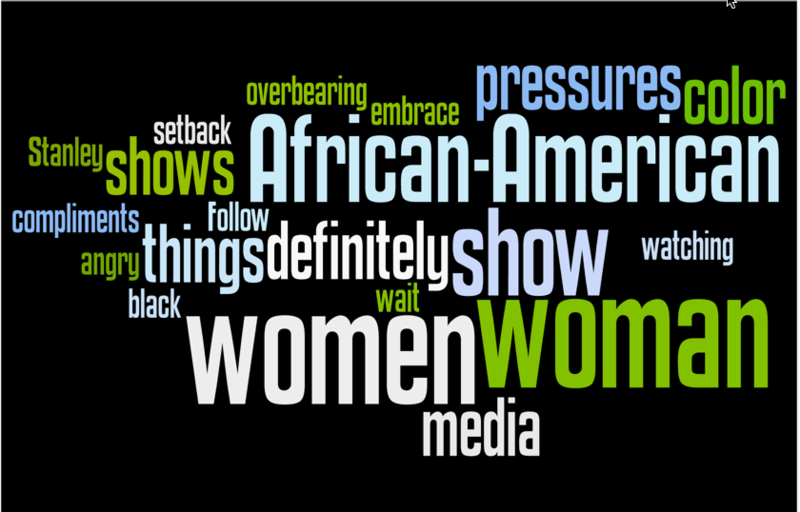 Television shows such as “Love and Hip Hop” and “The Real Housewives of Atlanta” showcase African-American women in dramatic situations that acknowledged the ‘angry black woman’ stereotype. However, watching shows like “Scandal” encourage me to embrace my authority as a woman of power in today’s culture. 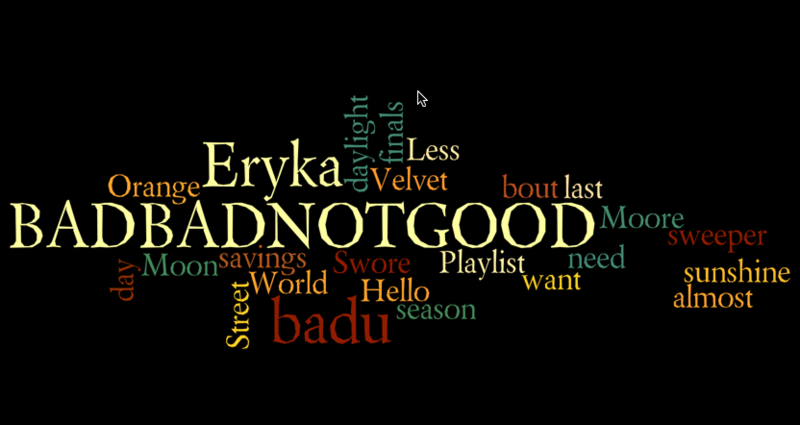 I finally have a modern show on TV with a strong African-American woman doing amazing things. The last show I watched liked that was “The Cosby’s”. Clair Huxtable taught me that women of color can actually have careers, have a family, and still be on top of it all. 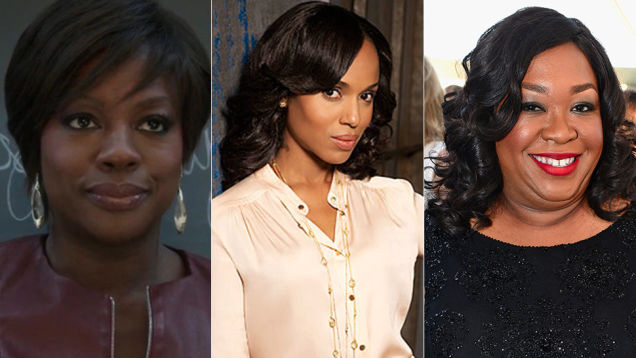 It’s so important to have those depictions of African-American women on television, and I’m glad they are there. The backhanded compliments of Alessandra Stanley were definitely unnecessary, uncalled for, and setback the advancement of women of color in the media. I can’t wait for the highly anticipated show “How to Get Away With Murder” so I can have another example of woman doing AMAZING things.  Follow @myhealthimpact for more on current topics impacting our health. Going straight from undergraduate to Ph.D. is a huge jump that I wish I was better prepared for. 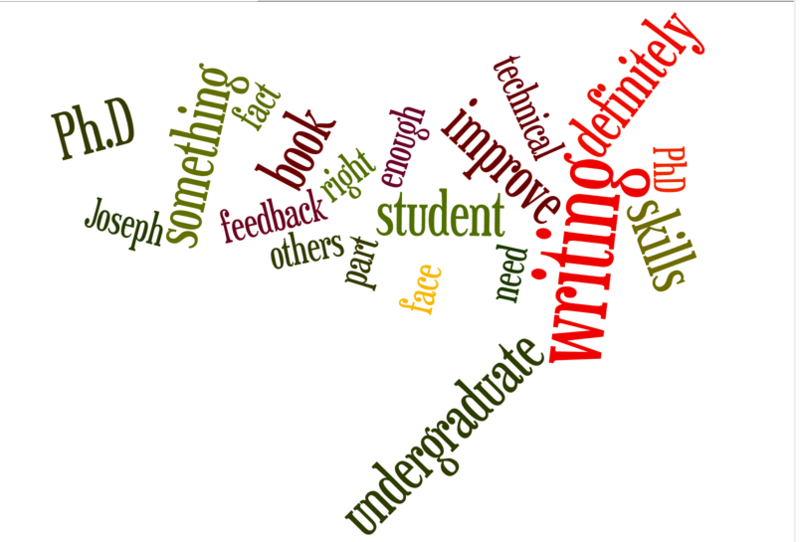 Technical writing is something that is very important as a Ph.D. student and wish I had more feedback on as an undergraduate who was interested in higher education. As I approach my fifth week as a Ph.D. student, I can definitely say that this path has been more rigorous than I expected. The class work is a bit more intense but it is fine. My technical writing skills is what shakes me up; something that I definitely have to improve on. It is not stressed enough in undergraduate studies but is clearly something that needs to be polished as a PhD student. 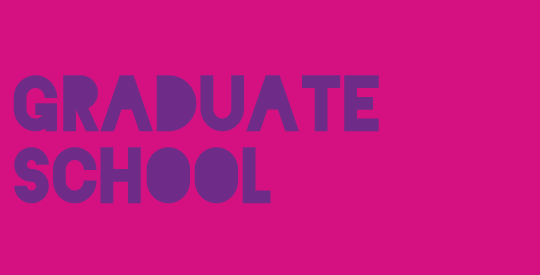 Writing to journals and conference proceedings is a right of passage and continues after graduation. Articles and publications need to be as easily understood as possible so that others can acknowledge the research. Weak papers will not be accepted in the scientific community. Personally, technical writing is a task that I have struggled with and have tried to ignore for so long. Unfortunately, now it’s time to face the reality of the matter. Recently, I submitted a proposal for a class project and the professor acknowledged that my thoughts were all over the place and recommended that I read and do exercises out of the book, Style: Lessons in Clarity and Grace by Joseph Williams and Joseph Bizup. The hardest part about reading the feedback was the fact that I know I have a problem, but have not yet sought out the appropriate resources. I’m just glad there are professors that care enough to help me to improve these skills and mentor me to success. Now that I have the book and I am actually pretty curious to see how much it helps my writing style. In addition, there are writing services offered by the NC State University that I will most likely be taking advantage of. Currently, my personal goal is learning to accept the fact that there are skills I need to improve upon. This book is definitely step in the right direction for me. As a new research scholar for MyHealthImpact Network I will be able to tell my sentiments in hopes that it will encourage others to not feel alone about the issues that I face. Communicating on this platform (myhealthimpactnetwork.org; @myhealthimpact) is a great way for me to connect with other students aspiring to pursue a PhD and those who are going through it with me. The best part of it all is that I’m telling my story and people are actually listening. Follow @myhealthimpact for my blog posts on the process. 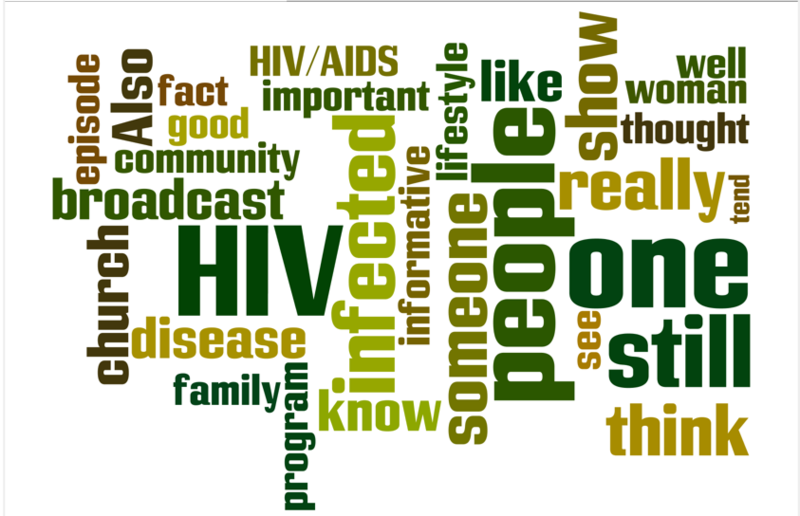 See how I write about what matters in health and my generation. Working with MyHealthImpact made me realize that settling for just my bachelor’s degree and that mediocre was not acceptable and that not following my hearts desire was not ok.
By the end of my junior year of college, I knew that working in my field (business) as soon as I graduated undergrad was not what I wanted to do…directly anyway. This caused me to do a bit of soul searching. In soul searching, it led me back to the only thing I talked about doing as a kid, which was being an educator. I did my research on what I needed to do, what programs to apply to and I went to work early on in my senior year. Initially while applying, getting out of North Carolina was my only goal. I applied to different school types and in different areas. 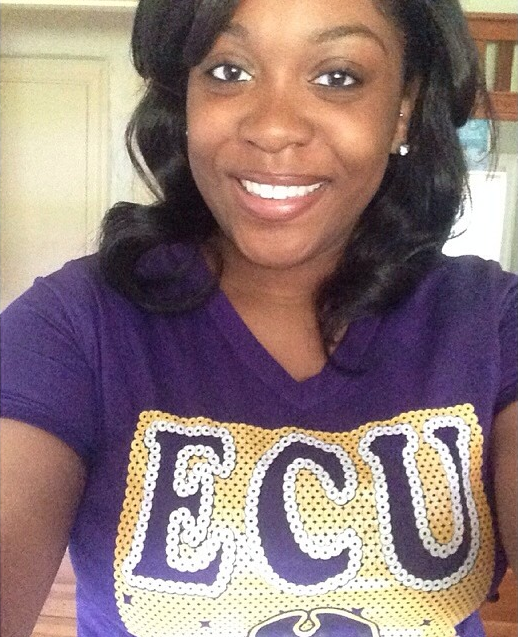 Amazingly, I ended up right where I never thought I would be; 30 minutes away from home at East Carolina University. This made me realize, that everything happens for a reason and exactly how it’s supposed to regardless of the plans I thought I had for myself. I will be working towards my Masters in the Art of Teaching starting in June and if everything goes according to plan, I’ll be someone’s fifth or sixth grade teacher starting August 2015. At first I wasn’t sure how to feel about going to a school so close to home but it began to grow on me. Once I met with some of the faculty and staff in my program, it slightly began to feel like home…exactly where I should be and exactly what I sh ould be doing. I’m completely excited about the next leg of life’s journey!! With less than one week until I take my MCAT, I’m starting to understand the importance of staying mentally sane and stress-free. My whole summer has been leading up to this point. Though my road to Medical School is far from over, performing well on this exam will make the process a little bit smoother. For the last week, I have made sure to take time out for myself. Though I have maintained the same study habits and schedule, I have made it an addition priority to take time to relax and not overwhelm myself with everything the MCAT entails. Sometimes knowing all the information does not automatically mean you will do well. It means you are prepared with understanding the majority of the topics. As I reflect and count down the days, I continue to tell myself over and over again, that all things are possible through Christ. I continue to build confidence in myself and in my ability. If I continue to have a positive attitude, then I shall receive positive results. At the end of the day, there are going to be some concepts I may not fully understand or certain areas I may need to excel better in; either way, I have to remain confident and not allow those struggles to hinder my success. Nevertheless, I can honestly say that I have taken all the necessary steps to prepare for the MCAT. I’ve purchased review books, taken several practice tests, hired a tutor, improved my time management and study skills, and most importantly, asked for help when I needed it. 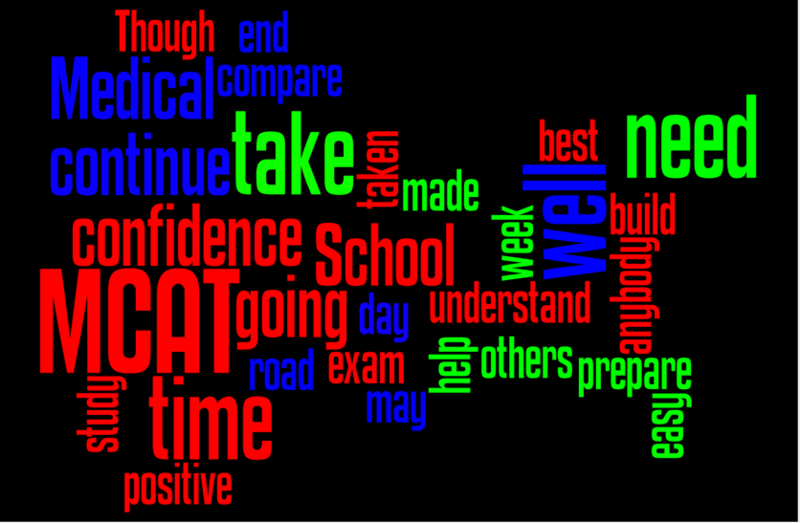 At the end of the day, on July 12th, 2014, I am going to walk into my exam with confidence. For anybody preparing for the MCAT and applying to Medical School, know that the journey is not easy. If it was easy, anybody could do it. Just remember that you have to stick to a schedule and a plan that works best for you. Seek help and advice when necessary, but DO NOT compare yourself to others. When you do that, you become more worried about others and how you compare to them, and not what you need to do to improve yourself. Remember that your happiness comes first. If you find yourself struggling or becoming overwhelmed, take a step back, refocus, and find what work best for you. Medical School and the MCAT are not going anywhere. Take all the time you need to prepare and build the confidence you well need to do well and be successful on your road to medical school.